C'est Moi, Sara Louise: Oh, is it Valentine's Day? I'm a little grouchy. Today is not Valentine's Day in my house. The Husband is working late tonight so we've postponed Valentine's Day to Friday, which I actually like, because Friday beats the crumpets out of Tuesday hands down, but still, it's all a little blah over here. And, I wanted to write a post today, but felt like since it actually is Valentine's Day, even if not in my house, if I didn't post about Valentine's Day, the blogger police would come for me. And how could I write about Valentine's Day when it's very un-Valentine like over here? So... what I'm going to do, is leave Le Petit Village behind, and take a trip to Hollywood to list some of my favorite couples who I'm sure if they really existed, would know how to do Valentine's Day... and wouldn't be lame like me and postpone it just because someone is working late #ImSoLame. I'll start with these two, Robin Hood and Marian, my first favorite movie couple. I always did think that the fox made a much cuter Robin Hood than Kevin Costner any ol' day of the week. 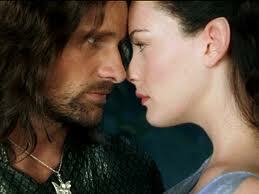 And for no other reason than I'm a Hobbit nerd, I give you Aragorn and Arwen. When they first met, he was twenty and she was over 2700, making Arwen the ultimate cougar. Vaughn: How do you wanna play this? Sydney: You wanna be rough, or you want me to be rough? Sydney: Are you talking about at home, or on Ops? Vaughn: Both. Hey, I'm not complaining! Sydney: Are we on coms? Agent Jack Bristow: Yes, you're both on coms right now. Now, I realize that Diane is missing from this photo, but do we really want to see a photo of Diane and Llyod, or a photo of Llyod and the boom box? And finally, Noah and Allie, because obviously. And a little note about The Notebook... when Disco Gayle was visiting, I found out that she had never seen The Notebook (what?! ), so naturally I put it on. When the movie was over, she turned to me, tears streaming down her face and said, "Why did you make me watch this? ", followed by an insane amount of blubbering. I told her that it was OK, The Husband's reaction when he saw it for the first time, was pretty much the same. Ooh great couples!! Now I have the urge to watch both Disney Robin Hood and Say Anything. Lloyd...always one of my favorites! My husband and I used to postpone Valentine's Day often back when he worked a regular shift at the firehouse. It's actually better sometimes - less crowds. I have never seen "The Notebook" and I don't want to because I really hate to cry during movies. Reading Disco Gayle's experience has sealed the deal for me where The Notebook is concerned. I have never seen The Notebook, but next time I'm dating a "girly man" I'm totally using him as an excuse to watch it. We are postponing too, so your not the only ones, my hubby has been away 8 days, back in 2. Have a good one on Friday! Love 'The Notebook' such a great film! Think we will be putting off Valentine's day until Friday too as my husband is also away. Great movie picks! 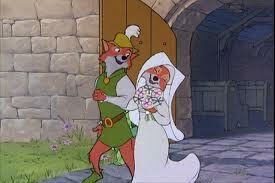 That foxy robin hood is up there with lady & the tramp for ultimate romantic cartoon couple. I cannot believe I forgot about Wesley and Buttercup! INCONCEIVABLE!!! I was JUST thinking that! Inconceivable, indeed! Aw, you are a softie. My mister is away today too but we aren't postponing Valentine's Day because we are Australian and don't give a crap about it. So there. I haven't seen The Notebook either as I'd heard it was very sad, and when I'm preganant I'm a hormonal mess as it is and don't need the extra stimulus. But now my birthin' days are over I have it on my iTV 'wish list' and will download it soon. Have a great V Day on Friday! You have lots of company on the postponement thing. Due to jobs and life, if it doesn't fall on a weekend we always postpone it! Same this year. I'll bet all the postponers will have even lovelier V-Days- hope you do! 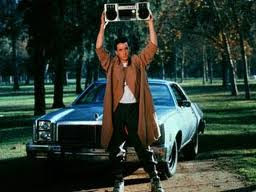 Say Anything....siiiggghhh. Never seen The Notebook, I'll have to leave it for a rainy day minus my man as he'd never want to see a film like that. He's an action film man (aren't they all?) mostly. Sara Louise, you really must see "Robin and Marian" before you decide on the right Robin Hood. I vote for Sean Connery hands down! Enjoy your belated Valentine's ... it's a lot like a two-week birthday celebration. Happy non-V day today, and enjoy it on Friday!! Are these all chick-flicks? I only one I knew was the cartoon! I don't think Lord of the Rings and Say Anything are chick flicks, but yeah, The Notebook is totally a chick flick.... in the best most sappiest of ways! I didn't cry at The Notebook. There. I said it. I didn't cry either! So there! i hear you saying this like andie macdowell....'is it valentine's day? i hadn't noticed.' so romantic. Robin Hood - clutch! I think my first faves were the kiddos from the Little Giants? Odd. Happy Valentine's day to you and your hubs! We celebrated last weekend and will again this coming weekend... in the meantime, come over and have cookies and Champagne at my place! Happy Valentine's Day, mon amie! Joyeuse Saint Valentin! The fox is definitely a much better Robin Hood than Kevin Costner for sure! I hope you have a wonderful Valentine's Day on Friday! VAUGHN AND SYDNEY!! I love them so much. I love that fox. A LOT. I even walked down the aisle to the Love song from that movie. Don't feel bad about waiting til Friday because it DEFINITELY beats the crumpets out of Tuesday. Ha! Crumpets. Ohimogsh, I laughed so hard with all the captions on your pictures, they were SOOOO funny!! I LOVE the scene with the fire flies. I thought it was the most romantic thing ever when I was little (and still do now that I'm thinking about it). Also the notebook. I cry everytime. You're not lame for postponing V-day! I did that last year with FBF and this year we have to because La Poste didn't get my package here on time (even though he sent it way before it would be necessary). Le sigh. Aidan and Sara - how did you NOT cry watching The Notebook?? Are you souless monsters??? I'm more in the Disco Gayle and Husband camp. The first time I saw it I was with my sister and we had to stay in the the theatre WAY after the credits had stopped rolling in order to regain some semblance of dignity. My husband had to work yesterday, too, so instead I had some girlfriends over for a "Galentines Day". I made dinner and we watched BRIDESMAIDS. My mother in law arrives next week for a visit, so we will probably foist the kid on her and celebrate Valentine's Day with a REAL date night (gasp!) then. I agree. Wesley and Buttercup should definitely be on that list. love say anything. also love that it's one of my husband's favorite movies. incidentally, i still love him, even though he HAD to go to band practice on valentine's day. luckily, he redeemed himself by taking me to sushi after. i didn't post about valentine's day on the 14th. hope no one comes after me.